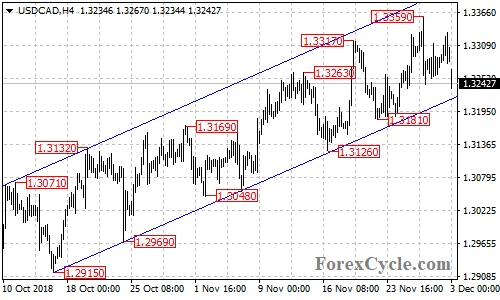 USDCAD is facing the support of the bullish price channel on the 4-hour chart. As long as the channel support holds, the pullback from 1.3359 could be treated as consolidation for the uptrend from 1.2782 (Oct 1 low), one more rise towards 1.3400 is still possible after the consolidation. Key support is at 1.3181, only a breakdown below this level could signal completion of the uptrend.